I would like to share with you my first experience of attending a training course in Canada. As a journalist, I usually write political or humanitarian articles and reports, but today it’s totally different. I have been in Canada now for one year and eight months. This is the first time I have attended a training course to get the opportunity to find a job. Its location is the “CCLC” Cross Cultural Learner Center in London, Ontario. My friend Iman works there and she advised me to get some Canadian experience. She first introduced me to Mr Mengesha who is responsible for training courses, and he agreed to have me as one of his trainees. The course in question is called “Life Skills Worker” and I am really excited to see how the course will develop. It’s now been four days since I started. We are six people from different nationalities with different languages and cultures. It was a good experience and we have exchanged a lot of information. During the sessions we discussed everything about newcomers and how CCLC could help them from start to finish. The life skills training teaches us how we can help newcomers. Here we learned to show them details of life in Canada. Mr Mengesha was the one who moderated the sessions and explained how to help newcomers and what they should know about the community, its norms, traditions and life in general. Activities also included educational skills and training that take place within schools, families or communities. The Life Skills Program aims to qualify us to be able supporters of the newly arrived refugees, helping and providing them with guidance and the support they need in order to adjust to life in Canada. The life skills training also taught us very important things related to fire safety at home, during our movements out, when using transport, or at schools, banks, shopping centres and other places. The life skills briefing also included conversation about the ethics of interpretation and housing. In conclusion, I can say it’s a really good experience. Anyone who masters this course can work well in helping those newcomers who need to know the basics of life in Canada. 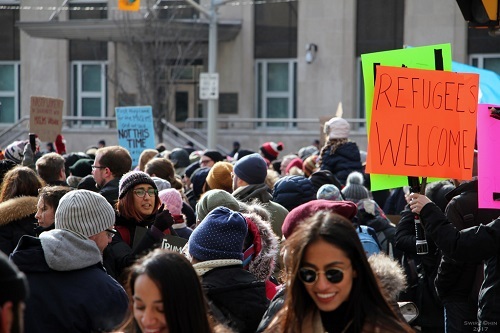 As a person who came here as a refugee with nobody to help me, I know how important it is to find someone who can lend you a helping hand and show you the right way to live safely and within the norms of Canadian culture. I would also like to mention one other good thing about this course. I found a place where I can leave my children while I attend the course, the CCLC have a day care program for newcomers’ children. Thank you everyone for the lovely experience.